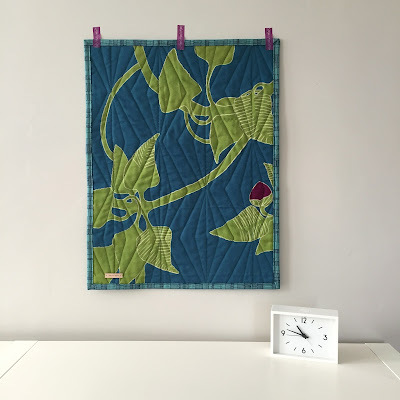 Ever since I received the latest batch of Maze and Vale fabric panels for the shop, I've been itching to sew with the new designs. 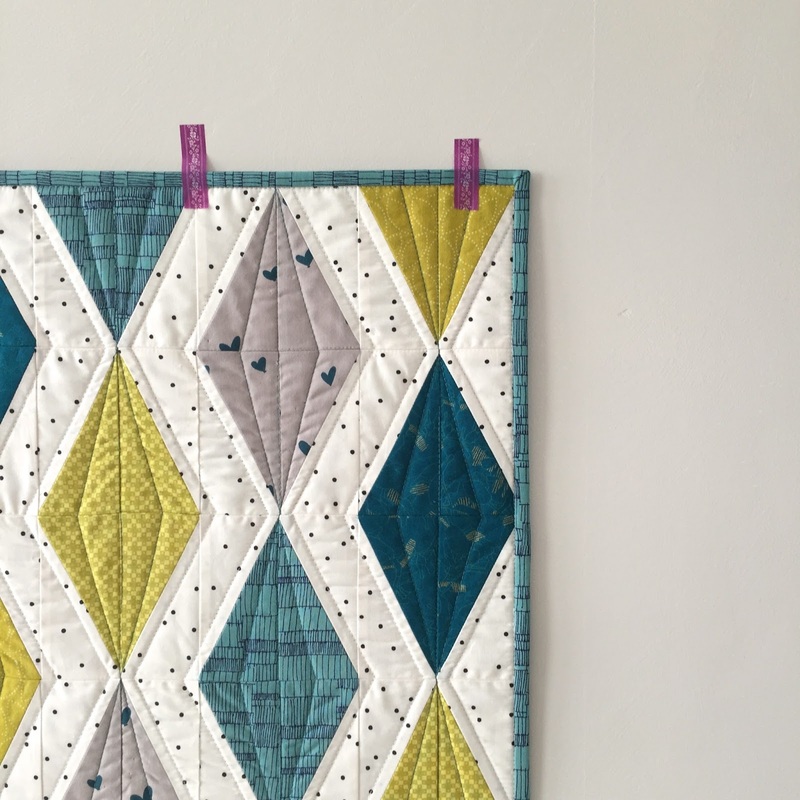 I'm quite smitten with the trio of prints that are printed on a gray organic cotton base cloth, so I picked this gorgeous teal heart print to use for my first project, and paired it with coordinating teal and chartreuse prints from my stash. 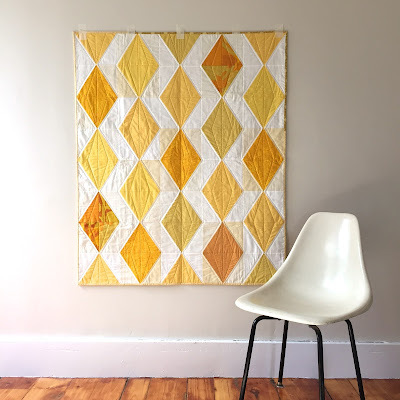 When it came time to figure out what I wanted to make, I almost immediately thought of the yellow-and-white diamond quilt that I posted recently, but actually made quite a while ago. 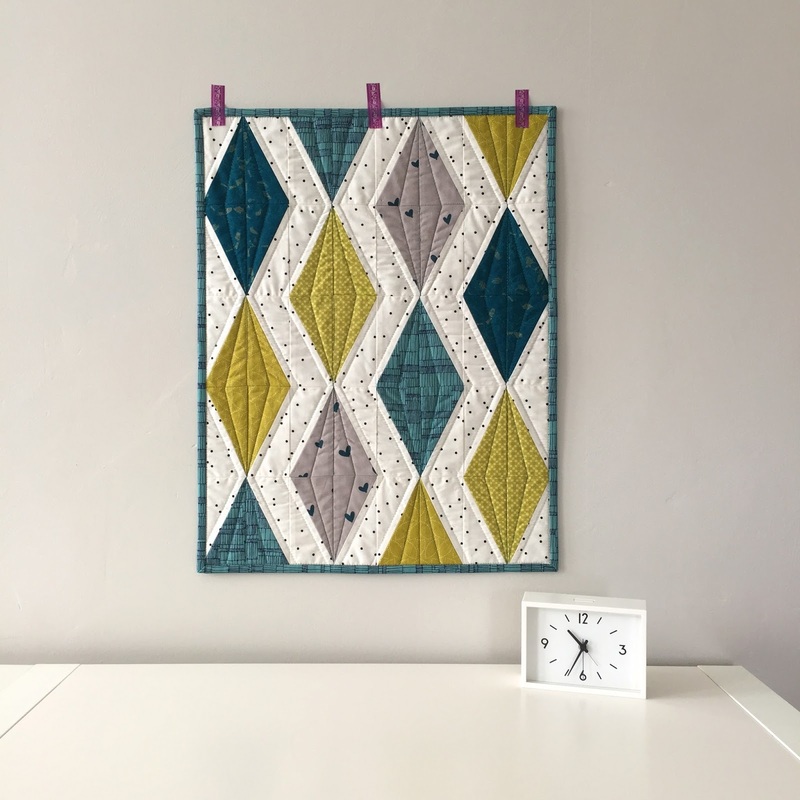 I loved how the pattern worked with solids and almost solids, so I decided to have a go at making another, smaller version, this time using only prints. 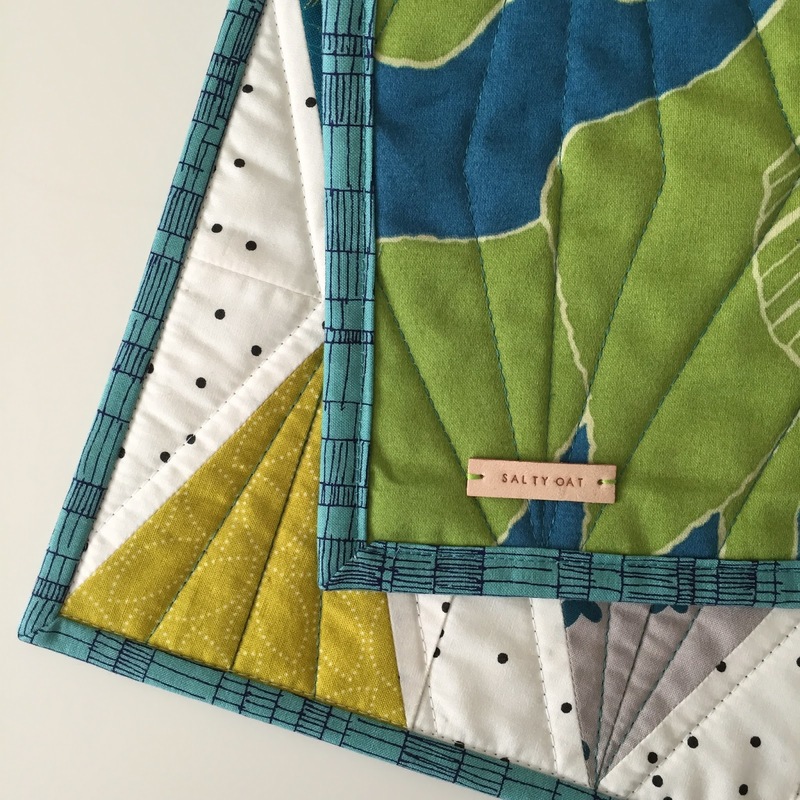 I auditioned a few different low-volume fabrics for the background, before settling on my favorite black-and-white polka dot. For the backing, I used a scrap of Marimekko vine fabric (I love the pop of eggplant from that lone bud!). 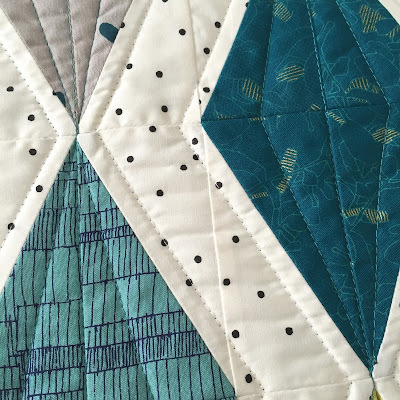 I used the same method of quilting for this version as I did with the original: white outline quilting in the background, and angled teal quilting lines within each of the diamonds. A pretty diamond pattern emerged on the back as a result. The teal heart print plays so nicely with the other prints, and I really love the mix of hand-printed and commercially printed fabrics. 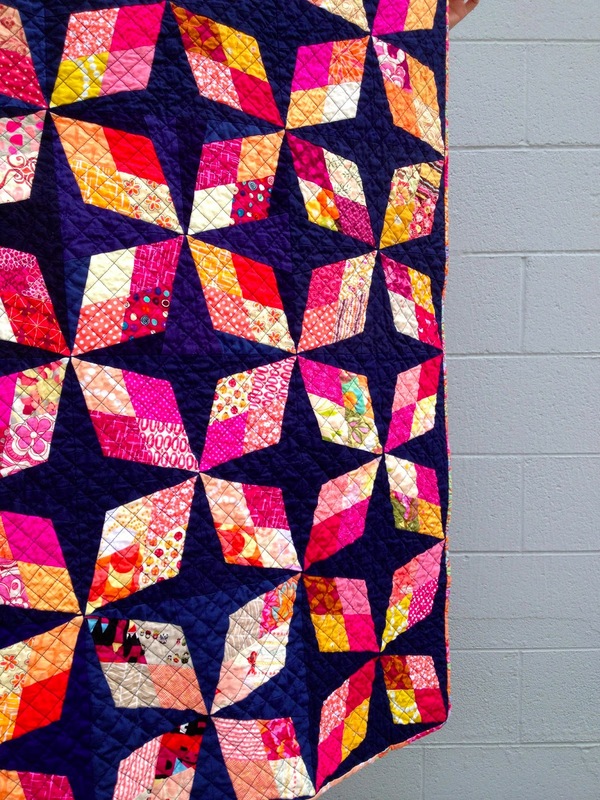 This quilt is now available in the shop, as are individual panels of the heart print. I would absolutely love to see what you would pair this fabric with in your own projects! Finished dimensions: 16" x 21"
Fabrics used include: LoveHearts in Deep Peacock by Maze and Vale; Firefly Whisper from Hello, Bear by Bonnie Christine; chartreuse prints from Chicopee and Hope Valley by Denyse Schmidt; and teal prints from Botanics and Doe by Carolyn Friedlander. Update: I've had quite a few people ask me for a pattern for this quilt. While I still recommend working with the tutorial originally published by the Modern Quilt Guild, Cluck Cluck Sew recently published a pattern for a quilt with a similar look, which may work for you as well. 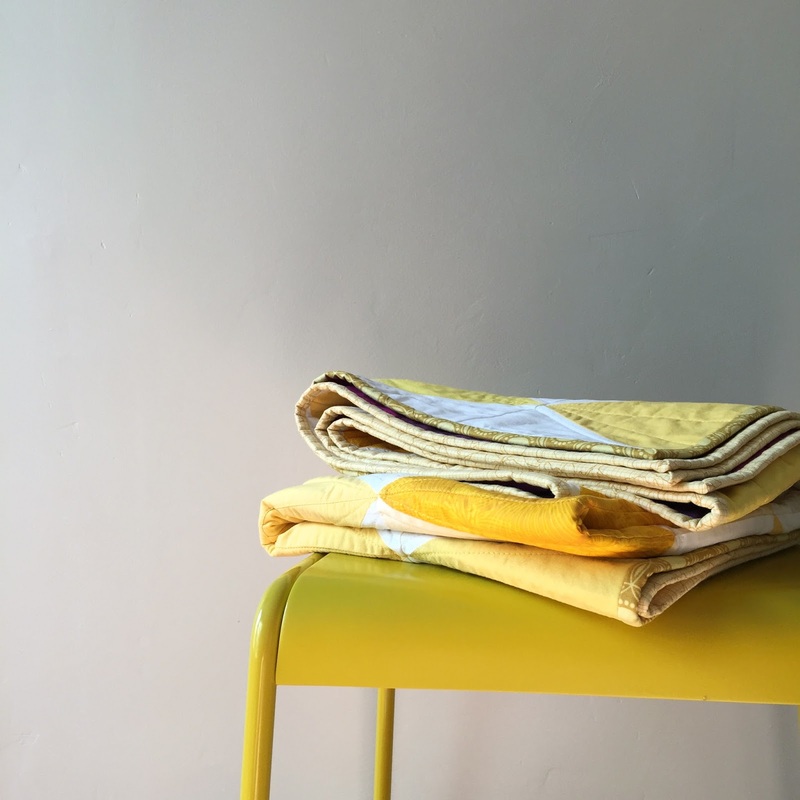 After making the yellow cross quilt for our do. Good Stitches circle early last year, and seeing how cheerful, yet simple and modern, the final result was, I was itching to make another yellow-and-white quilt. 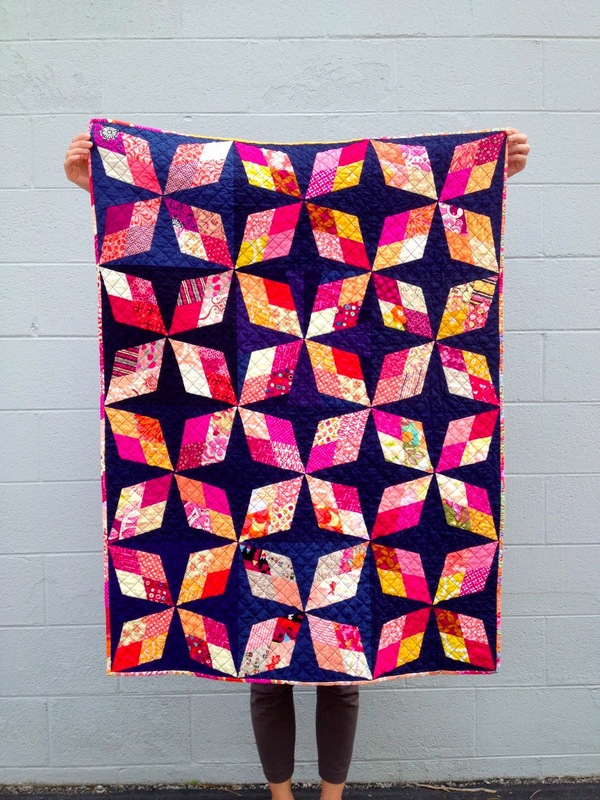 When I attended my first Quilt Market back in 2012, I had the pleasure of meeting Melissa Lunden, of Lunden Designs. 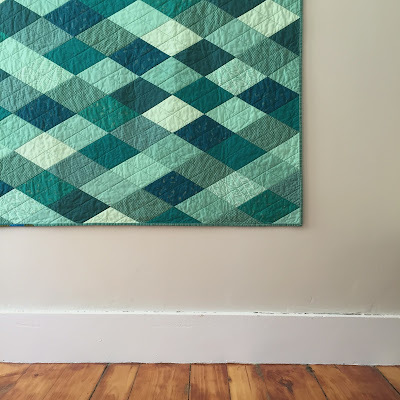 Melissa designs gorgeous quilts, and I've had the chance to test a few of her patterns. 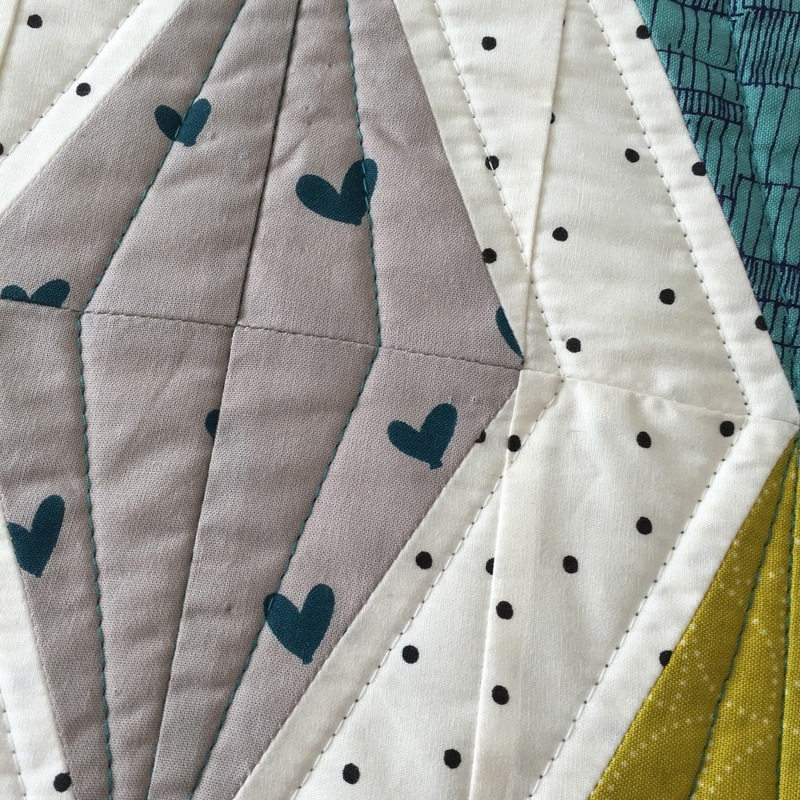 The first pattern of hers that I tested was the Star System.